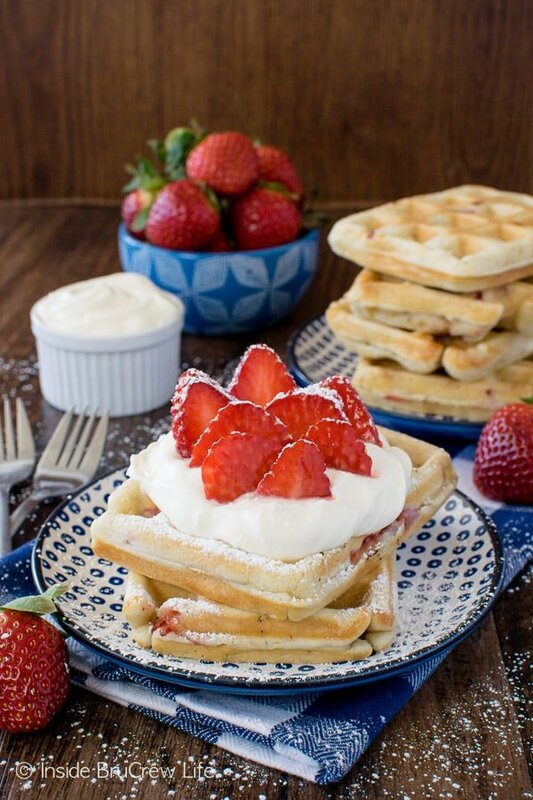 Homemade Strawberry Waffles are just the thing to make your weekend awesome. Everyone loves a day that starts with waffles, right? Last summer I made a few different kinds of waffles for our kids to eat for breakfast. 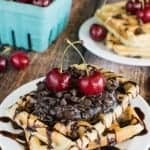 (These cherry chocolate chip waffles were intense!) This got me all excited about waffling all the things because who doesn’t love waffles. Then I got side tracked by making desserts for fall and the holidays. All of a sudden the New Year was here, and I just realized that I haven’t made any more waffles. I’m on a mission to change that right now. 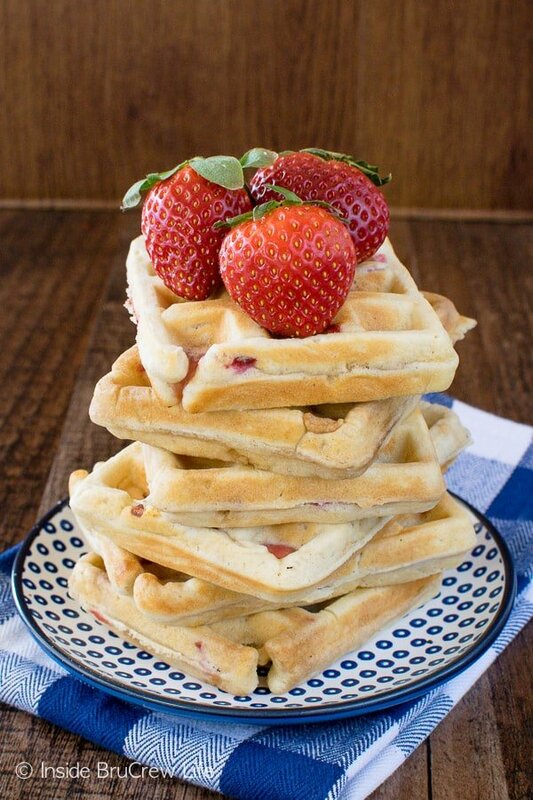 Our kids love homemade pancakes, so I have a feeling that a few more batches of homemade strawberry waffles in the freezer would be ok with them. Usually when I buy fresh fruit it mysteriously disappears. There are 3 kids that transform into fruit monsters when I turn my back. Not that I’m complaining. I’m glad they still like to eat fruit over the brownies and congo bars that are usually sitting on our counters. Of course, that means I need to be smart and buy extra fruit when I want to make something because it will be gone in a hurry. 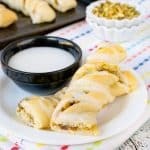 Last week I bought a couple extra boxes of fresh strawberries for snacking and because I was going to make another batch of strawberry Nutella twists for an after school snack. But then I saw my lonely waffle iron and decided that a batch of waffles was a better idea because the freezer was getting empty. I’m not a morning person, so I take any chance I can get to make breakfast ahead of time. These waffles can be refrigerated for a few days if you think your family will eat them quickly. Or you can lay them in a single layer on parchment paper and freeze them for 30 minutes before putting them into a large freezer bag. Now comes the fun part of a waffle…the toppings! I happen to love making my waffles look like they are from a fancy breakfast restaurant. Give me all the dips, fresh fruit, and powdered sugar on top. My daughter on the other hand just wants syrup on her waffles. 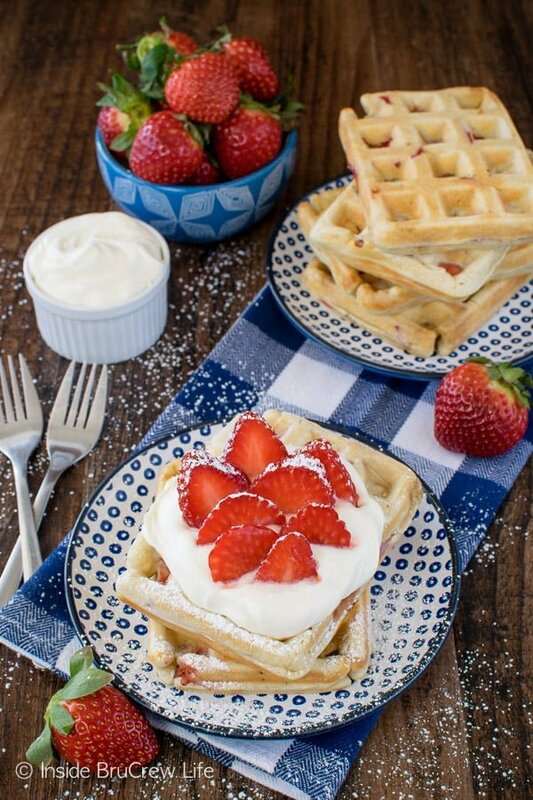 Either way is perfectly acceptable, but why settle for plain syrup when you can jazz those homemade strawberry waffles up with lemon cream fruit dip and fresh berries? 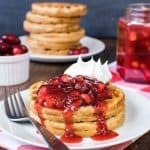 Head over to Food Fanatic where I am one of the breakfast contributors to print this homemade strawberry waffles recipe. *This post does contain affiliate links. We may receive a small percentage from sales made through these free referral links. As always, these do not cost you any extra. Thank you for letting share products we use and love this way. DANG these look good. Like strawberry shortcake for breakfast! 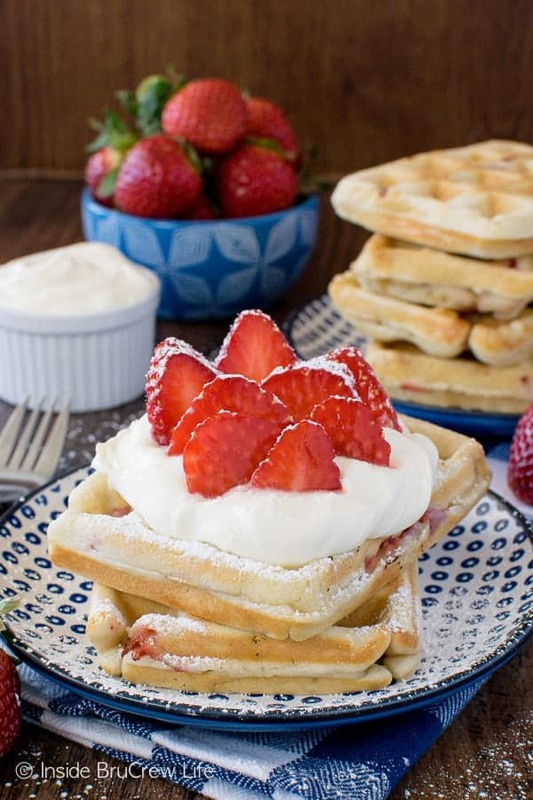 Love adding strawberries to waffles! 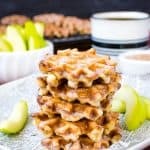 Freezer waffles are such a great option for quick and easy breakfasts. I need to try these soon! Made these this morning with my daughter. They came out very dry and not what we were expecting. I don’t know if we’ll try this recipe again. 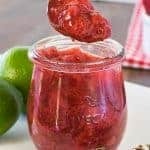 But if we do I would definitely kick up the strawberries and add way more. Overall a very disappointing waffle recipe. These waffles were not at all dry when I made them. I did a check of the recipe and found that the half and half was missing from the ingredient list. That has been fixed. Also, I tried a test batch with more strawberries and they were too wet and gummy, so I actually do not recommend using more. The half and half is not listed on the ingredients list with an amount. It is just mentioned in a step. This may be why they came out dry. The batter actually makes 12 waffles. Now obviously this could and will differ depending on what size waffle iron you have and use. Mine makes small rectangle waffles, so I got 12. The half and half was not listed on the ingredients list but is in the steps. 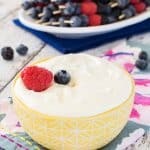 The heavy cream listed is for the lemon cream mixture. Oh, my goodness. You are correct. I just went back in and fixed the recipe to show the half and half too. I’m not sure how I missed that. The serving amount is actually the amount of waffles that the batter will make. It’s done this way so that when people calculate the calories they can see what a single waffle is. This will obviously differ though depending on what waffle iron you use. Mine makes small rectangle waffles, so I got 12 waffles out of it.